The average journalist gets hundreds of emails, dozens of phone calls and countless social media messages each day. It can be a real challenge for companies, non-profits and government entities to have their news stand out in all that. 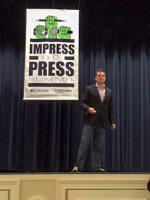 It is an issue the "Impress the Press" event aimed to address. The Delaware Tourism Office and Delaware Economic Development Office hosted the half-day conference in October at Dover Downs Hotel and Casino. 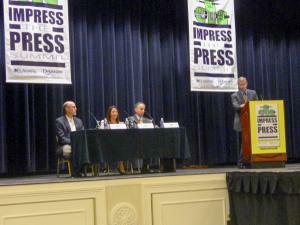 About 130 people heard from members of the press and strategic communications professionals. Brian Selander, former chief strategy officer for Delaware Gov. Jack Markell and current executive vice president at Whistle Sports Network, gave the keynote address. “You’ve got to think from the reporter’s mindset,” he said. Attendees had the chance to learn exactly what a reporter&apos;s mindset can be from actual journalists - NBC 10 Delaware Bureau Chief Tim Furlong, WDEL Assistant News Director Amy Cherry and Wilmington News Journal News Director Phil Freedman. Also Jill Horner, host of Comcast Newsmakers, did a mock interview discussing PR with Justin Williams, former Off-Centered Storyteller at Dogfish Head Brewery. Linda Parkowski, director of the Delaware Tourism Office, said it was a day full of practical advice. “The event gave local businesses and organizations some crucial tools for leveraging media publicity in ways that are effective and cost-free,” said Parkowski. To emphasize that final bullet, Freedman showed his inbox, which had nearly 11,000 unopened emails in it. Mike Rasmussen, co-owner of Painted Stave Distilling in Smyrna, said it was nice to learn about how to effectively work with the press. His company even tweaked a release the day after Impress the Press based on their new knowledge. "I thought it was definitely a worthwhile event as a refresher on what to do and what not to do. It&apos;s always beneficial to interact with the people you send releases to - to know what they&apos;re looking for," said Kate Bell, who handles events for the Rehoboth Beach-Dewey Beach Chamber of Commerce. Impress the Press impressed on Twitter. During the conference its hashtag (#ImpressPressDE) was trending in the Philadelphia region. Tweets related to it reached almost 80,000 accounts and created more than 210,000 impressions. Previous conferences the DTO has hosted have covered social media and putting on festivals.